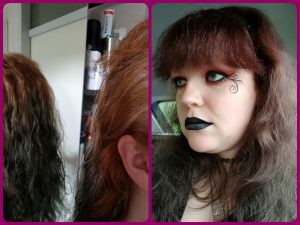 I’ve used Herbatint hair dye in May/June. I’ve used Aubergine and Black. So I got the 2 boxes of hair dye, a hair dye accessoires kit (because surprisingly I didn’t have one yet) and the shampoo & conditioner. The hair dye comes with shampoo, conditioner, colouring gel, some sort of fixative (it’s in French and Dutch, but no English for some reason…), a glove and instructions. So I’ve followed the instructions and the colour turned a bit more red than expected, but I’m fine with that. 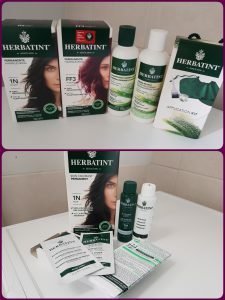 I do NOT bleach my hair ever, so I know that the colours are not exactly like on the box, but I did hope that it would have a little more of the purple to it. The before and after. The orange-red is my natural colour and I was groing it out for about 6-7 months. I’m happy with the result and the application & everything went fine. The problem was, that the hair dye faded really quick, but I chose herbatint because it was a permanent dye. It faded quicker than the semi permanent hair dyes from Manic Panic and I pretty much only wash my hair once a week. I do like that it’s a more natural hair dye, but I do not have the time to dye my hair every 2 weeks.